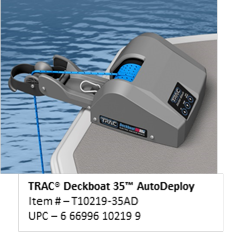 Nashville, TN, January 20, 2015 – TRAC Outdoor Products introduces the TRAC® AutoDeploy Anchor Winch Series, Anger 25™ AutoDeploy and Deckboat 35™ AutoDeploy. 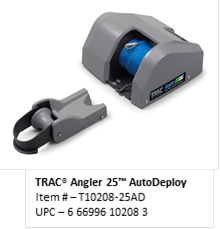 TRAC Outdoor Products’ newest Anchor Winch introductions have Touch and Release AutoDeploy. With the touch of a button (press and release), TRAC AutoDeploy automatically powers down the anchor smoothly and quietly, while you go about your boating activity. When the anchor reaches bottom, the winch stops then will transition from steady power-deploy and begin releasing rope just a few feet at a time, until there is enough rope out. The winch will then “lock”, holding the boat’s position. The amount of rope deployed can be adjusted by pushing UP or DOWN at any time. Or, press the AutoDeploy button again if the anchor drags due to changing conditions, such as wind or current. In addition, when the anchor winch stops letting rope out, the winch can be “locked” manually by pressing any switch button. Best of all, the user doesn’t have to hold the DOWN button until the anchor touches the bottom. This feature is great for fishing to allow a “controlled” drift; and great on pontoon and deck boats where there are distractions. The AutoDeploy Anchor Winches come with a sealed membrane switch on the winch housing and a wireless remote control. The remote includes a bracket to hold the remote secure at the helm or wherever the user chooses. For the Angler 25, the anchor davit can be installed away from the winch or attached tight to it. For the Deckboat 35, the davit is integrated with the winch frame for the easiest installation of all our winches and requires just 10”x10” of deck space – least in industry. Like all the TRAC Anchor Winches, the AutoDeploy Series comes standard with rugged all-steel gears, 100’ of 0.20” pre-wound double-braided anchor rope (700 lb. tensile strength), auto-resetting circuit breaker, 17’ of 14-gauge marine-grade battery wire, an anchor safety cable and all assembly hardware. It runs quietly and smoothly on 12v power with low amp draw. TRAC Outdoor Products Company is a US-based product design and development company. The company has been supplying packaged consumer goods to the Marine, Fishing and Sporting Goods markets as well as OEM components to boat and trailer manufacturers for over seventeen years. TRAC focuses on 12 volt powered products with an emphasis on the boating/outdoor enthusiast. TRAC Outdoor Products Company is motivated to make leisure activities less work and more enjoyable for our consumers. We design products to exceed customer expectations in the opening to mid-range retail price-points. Our leading product lines under the TRAC® brand name are electric winches for both trailerable boats and anchors. The company also brings to market many more items, ranging from Bilge Pumps to Utility Carts – all to support the marine and outdoor lifestyle. For more information, please visit www.trac-outdoor.com. Posted in News on January 22, 2015 by CERat.